The energy market presented many fluctuations during March. 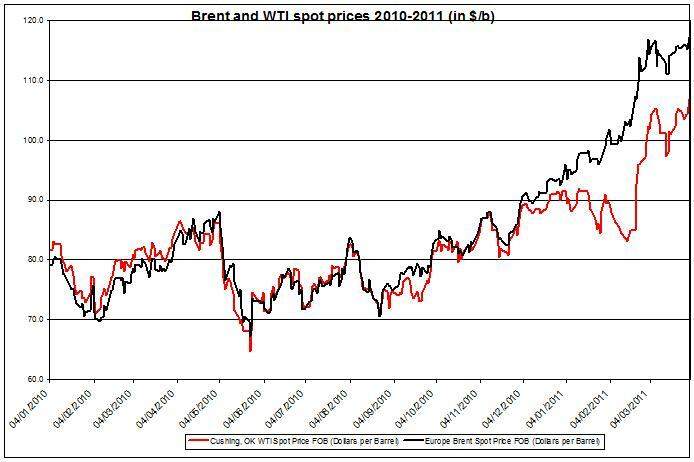 I will shortly present the main characteristics of crude oil prices (WTI and Brent oil) during March, and will ask what will be next for crude oil prices in April 2011? The month of March closed with WTI spot oil prices rising by 7.1%, and Brent oil price increasing by 3.4%. 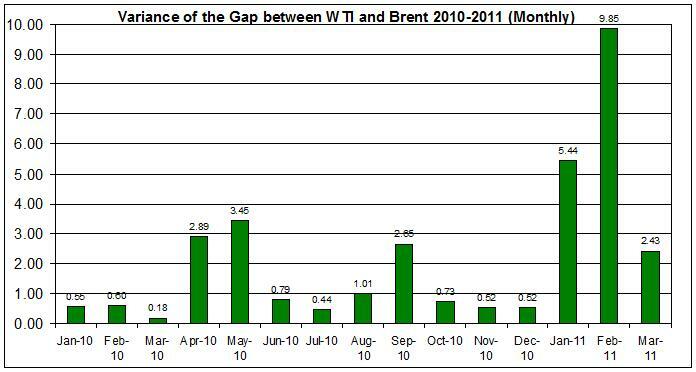 As seen in the chart below, Brent oil and WTI presented an upward trend in the past six months and a drastic prices hike from the end of February 2011. This rise was probably related to the uprising in the Middle East and in particular in Egypt which then reached Libya. The war in Libya along with the tsunami attack on Japan probably tipped the scale again and pressured crude oil prices to further rise during the second half of March. Crude oil prices didn’t present a strong correlation to any of the major currencies during March. The strongest correlation of the daily percent changes of crude oil prices was to Canadian dollar/ US dollar exchange rate with -0.28. The gap between the two commodities remained around the 7-14$/b during March, and didn’t fluctuated as it did during February. The variance rose during January and peaked during February. In March the variance declined to 2.43$/b. During April I speculate this premium will probably continue to be around 10-15 US/b and the variance not rising above the level it reached during March. 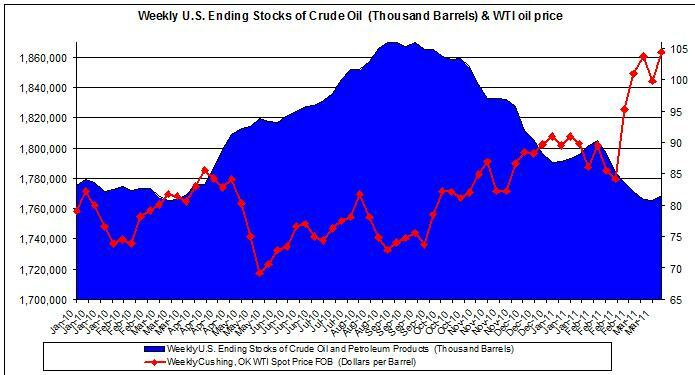 The petroleum stocks are still low in historic figures (but as expected for the season) and ended March on 1,768 million barrels. (For the full petroleum report, see here). During 2011 US oil stocks’ correlation with WTI crude oil price declined in 2011 , compared to 2010: in 2010 the correlation was -24.3%, and in 2011 (Jan-Mar) so far the correlation was only -14.3%. This is probably an indication of the strong affect the turmoil in the Middle East has had on crude oil spot prices as it crowded out the effect the changes in US oil consumption had on oil spot prices. As stated above, I speculate that the difference between Brent oil and WTI will not increase in April, this means they will move in concert as they did during March. Furthermore, since crude oil prices already incorporated most of the uncertainty of the events from Middle East and Japan, it’s likely that these events won’t have an additional affect on oil prices in April. Excluding any further deterioration in the Middle East, it’s likely that crude oil prices will continue to level out and might even moderately decline throughout the month of April. ← Gold prices outlook for April 2011 – what’s next for gold? Plese send me last 6 months crude oil prices. 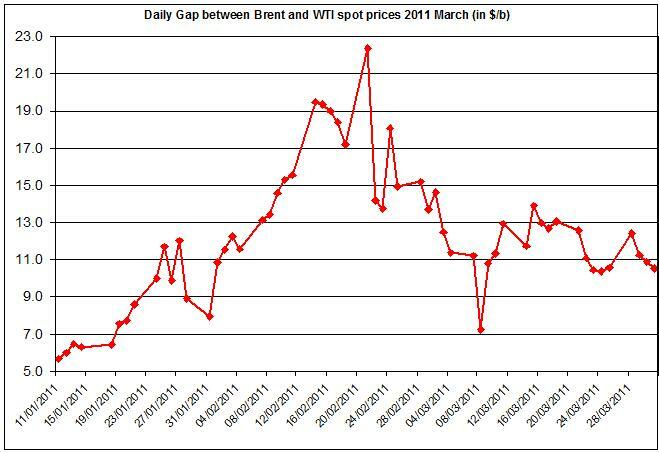 How are the current crude oil prices increases compare with 2008? In a nutshell, the recent rises in oil prices are driven from similar reactions to different causes all could be boiled down to speculation and uncertainty (putting it very simply…): in 2008 oil prices reached nearly 150$ per barrel because (among other reasons) of the financial crash in the US that affected the entire world. In 2011 the QE2 program of the FED along with the weak US economy keeps the commodities prices high, along with the recent turmoil in the Middle East that added additional uncertainty and impeded oil supply.